Keep your iPad Mini protected with the Logitech Folio Protective Case for iPad Mini. This strong, durable case is made from water-repellent materials and wraps around your iPad to provide both front and back protection against bumps, scratches, and spills. Plus, it features the SecureLock system which clips the corners of your iPad firmly into place. Coupled with the magnets that help keep the folio closed, your iPad Mini will stay securely protected everywhere you go. This versatile case can also be transformed into a multi-position stand, offering you the perfect angle for reading, viewing, playing, and typing, and includes an automatic wake and sleep feature so your iPad is ready when you open the case, and goes to sleep when you close it. Strong - The durable, wrap-around case is made from water-repellent materials and helps protect both the front and back of the iPad from accidental bumps, scratches, and spills. Thin and Light - Precision engineered with state-of-the-art materials, the Folio is sturdy, yet incredibly thin and light. 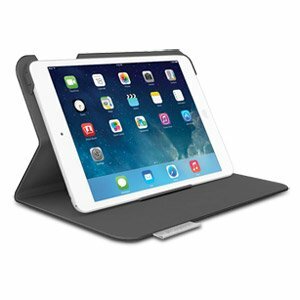 Safe - The SecureLock system clips the corners of the iPad firmly into the Folio, while magnets keeps the folio securely closed. Versatile - The multi-position stand holds the iPad at the right angle for reading, viewing, playing, or typing.